After applying principles of generosity learned from “Attorney Paul,” John started selling the largest deals in Cutco history out of 1.5 million other reps and distributors. Yes. 1.5 million. 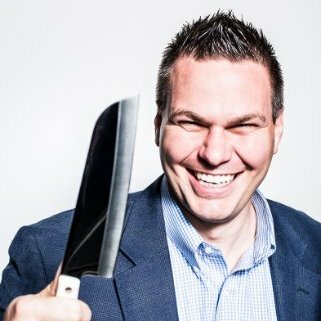 Not only was he gifting knives but he was being asked to speak on stages around the country to teach sales and marketing teams how to build relationships in unconventional ways. Simple but powerful things like focusing your care on the executive’s spouse, the assistant, and kids. Ruhlin Group started in 2000 and quickly broadened gifting options and strategies, but many of the original principles never changed. Knowing how and when to give gifts is just as important as what to gift. These “minor” details and expert knowledge have been tested and proven over a decade to bring a guaranteed “wow” to any industry from financial services to manufacturing widgets. Today John and his team have created gift packages for some of the largest companies and pro sports teams in the world, but their mission and heart is to serve and take relationships for mid-sized, privately owned businesses to a new level using their Proven Process. How to stand out and be even MORE referable to clients and referral sources. Relationship retention and growth through constant gratitude. How to drive sales through deepening relationships. If you haven’t read Chet Holmes’ masterpiece The Ultimate Sales Machine, this workshop picks up where that book left off. We look at best practices around drip campaigns and shock and awe programs but we amplify and put on steroids the basic ideas that made Chet a sales master. We help you identify your dream 100, get your sales and marketing team fully bought into what is needed to leverage a true shock and awe campaign, and lay out the sequence of world class gifts (no trinkets) and follow up sequences needed to go whale hunting and land the largest deals your company has ever seen. I say my employees are my most important asset but am I really showing it? What do we really do that is different than other companies to show gratitude and appreciation to our people? Why do I need to do more than just pay them well? When does appreciation mean the most to the team? How much should I be investing in them? Who are the”hidden” employees that are often neglected? How do I measure the impact? Everyone knows it is easier and less costly to keep a good client than it is to bring on a new customer but does my allocation of resources and appreciation show this reality? Who are the 10, 50, 100, or 1000 key external relationships that make up the core of my company? What suppliers are crucial to my company’s success and what would happen if they went away? Who are the center’s of influence and media that can affect deals and perception in our industry? What can we do to inspire referrals to happen on a consistent basis? What would happen if each time someone left a core client, they brought us along with them? Who are the mentors, board of directors, and other key people that have helped our company thrive and grow and what are we doing to acknowledge that in a meaningful way?